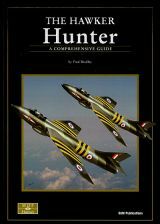 The Hawker Hunter was one of the most elegant jet fighters ever to be developed. After initial problems with the operation of the cannon at high altitudes had been solved, it became very popular with pilots due to its light handling and great manoeuvrability. It was also much loved by aerobatics squadrons. 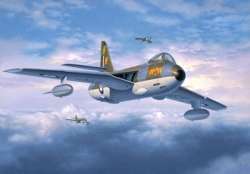 Developed from the concept stage as a fighter-interceptor and for ground attack missions, the improvements and additions made to the final version, the FGA.9, reached their highest point for low-level attack. Over 380 of the F.6 were built for the RAF, where this type formed the backbone of RAF Fighter Command. An even larger number were exported throughout the world, the Netherlands and Belgium being the largest users. Decals are included for aircraft of the Royal Air Force, KLU and Belgian Air Force.